No need to go for those painful pinches! Get natural. Get beautiful. Finally a solution to energize your skin without medical hassles! Aaranyaa, a brand known for its premium beauty formulations and expert skincare is all set to thrill the industry yet again with their revolutionary discovery – the EE cream. Energy Enhancing, this cream is formulated with skin rejuvenating okra extracts. Also known as Hibicus Esculents scientifically, Okra is also commonly known as a BOTOX PLANT which helps revive your skin, reduce wrinkles naturally and strengthen the skin cells. • Okra has been considered as a noninvasive alternate to intensive procedures like Botox injections and artificial dermal fillers .Unlike from these costly Botox procedures with side effects, Okra reduces the need or extends the time between procedures by providing an ANTI-WRINKLES effect on fine lines. • It’s rich in mucilage and some sugar components that hydrate and protect skin. • Application of Okra extract is helpful in treatment of dry , old , dull and wrinkles skin. • Okra extract is a natural treatment for expression lines. After years of research and laboratory trials by world renowned cosmetologist Dr. P R Singh, there is now at last a way to revive your skin without troublesome medical procedures or clinical treatments. 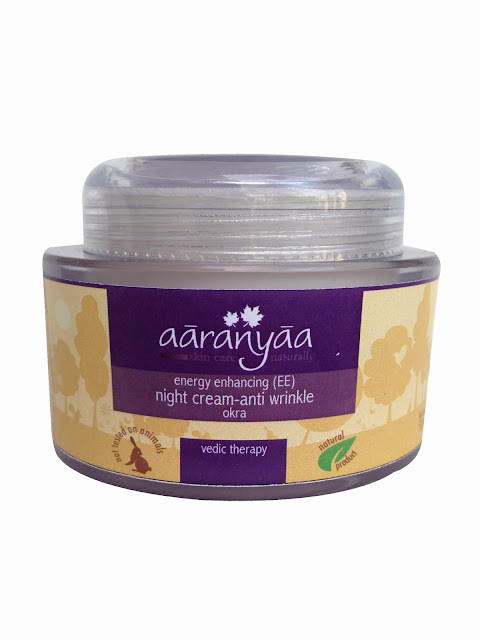 Primarily made using only the finest natural ingredients and essences, Aaranyaa’s new EE creams maintain the brand’s motive to enhance your skin naturally. To repair, nurture and strengthen your skin, Vedic natural has launched the remarkable new Aaranyaa EE cream that will improve the skin's natural barriers to irritants and cure all your ageing skin problems. With the promise of delivering superior skincare benefits and international quality, it has proved to be a top of the line natural anti wrinkle cream. Get ready to experience nature’s new gift and bring alive the youthfulness of your skin with the finest skin formulae from Aaranyaa. B, C, D and now E taken..
Never heard of EE cool not a bad review doll. So many benifits in one cream, I am surely trying it out..
Its such a break through and I am not sure if we have anything similar to this product. Heading to check on the online purchase now. This sounds like a wonderful products Radha, thanks for sharing, xoxo.